BETHLEHEM — What had the makings of a blowout turned into a shootout between two Suburban Council rivals with The Eagles coming out on top over The Lady Dutch by a final tally of 18-14. Bethlehem (3-0, 4-0) jumped out to a 7-2 lead and took an 11-6 lead into the half. At one point in the second half the Lady Dutch came within two goals but The Eagles persevered. Nine Eagles found the back of the net with Lindsey Ayers leading the way with six goals. Mae Healy had three while Ashlynn McGrath and Caroline Wise had two each. Amy Burdick, Piper Gregory, Paige Halliday, Kiersten Murray and Lauren Riker each chipped in a goal. For Guilderland (1-2, 1-2) Amanda Neiman and Lauren Thompson had five goals each while Jamie Golderman had three and Caitlyn Miller had a goal. Caitlin Mooney had 10 saves for Guilderland while Lindsey Isenberg and Sophia Koch combined for seven for Bethlehem. On Tuesday, April 16, Bethlehem will play at Ballston Spa and Guilderland will host Penfield. 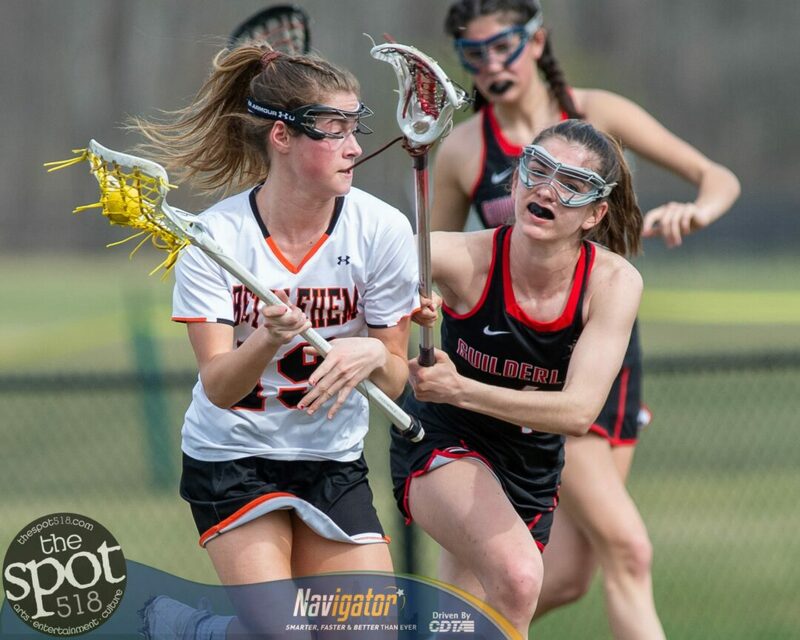 Bethlehem will host Shaker on Monday, April 22 and Guilderland will play at Niskayuna on Thursday, April. 18.